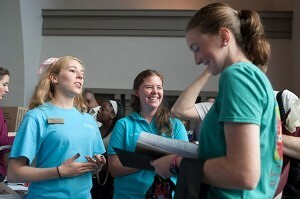 The Residence Life Department is made up of professionals and paraprofessional staff members. The RA (Resident Assistant) is a highly trained upper-class student who is charged with the daily management of their assigned residential area. Daily tasks include responding to community crisis, maintaining a positive learning atmosphere, enforcement of University policy and upholding the Brenau Honor Code. The Housing Coordinator and Director of Residence Life supervise the RAs in addition to the responsibilities listed above. The Dean of Students oversees the departmental operation of Residence Life in accordance with national and regional guidelines. The RA On-Call staff is a rotating group of Resident Assistants who assist with maintaining building safety and security, lock-outs, after-hours maintenance concerns and/or individual difficulties. The RA On-Call Staff begins their shift weekdays at 5:00 p.m. and finishes at 8:30 a.m. the following day. On weekends, the RA On-Call Staff begins their shift Friday night at 5:00 p.m. and finishes Monday morning at 8:30 a.m. RA On-Call phone numbers are posted throughout each hall. There are a total of 4 RA’s On-Call each night for the entire campus community, excluding dates when the University is closed.